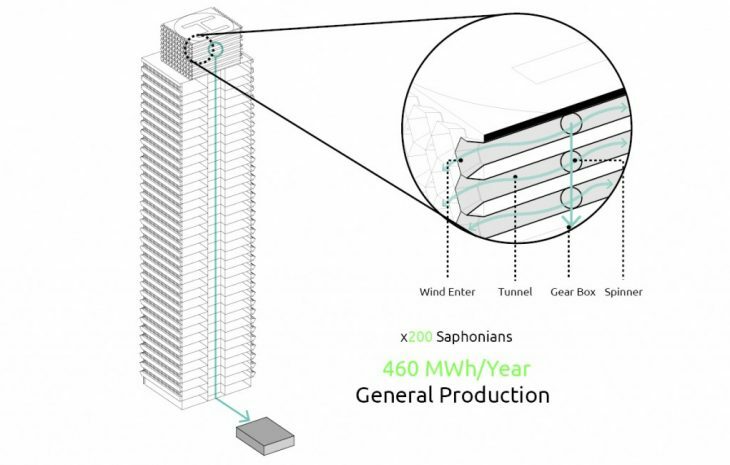 Developing an energy self-sufficient neighbourhood is the focus of this studio. 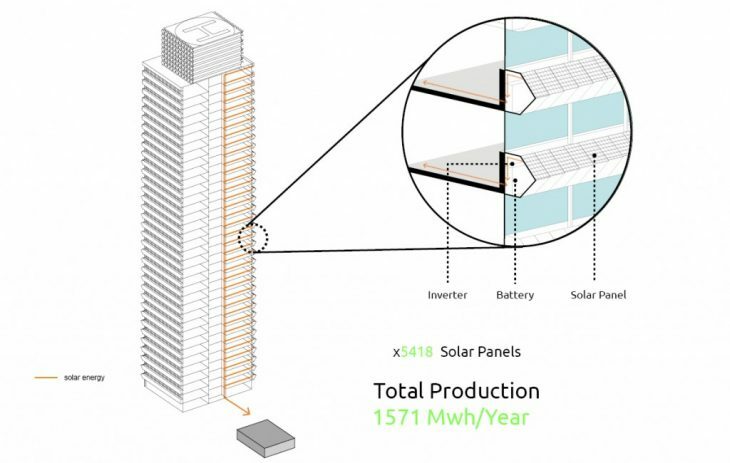 What comes to your mind when green energy production technologies are mentioned?Did you think of a large area in the desert covered by solar panels? Huge wind turbines? Or maybe you thought of the hydro turbines in dams that generate energy.But these are too big to embed in a neighbourhood scale. So what is the implementation scale for a neighbourhood? 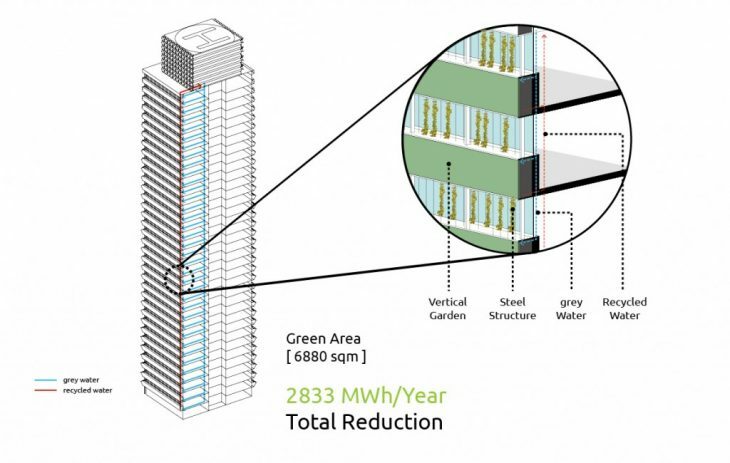 The key to this is rethinking the existing elements in the city, and implementing the green energy production technologies in them. 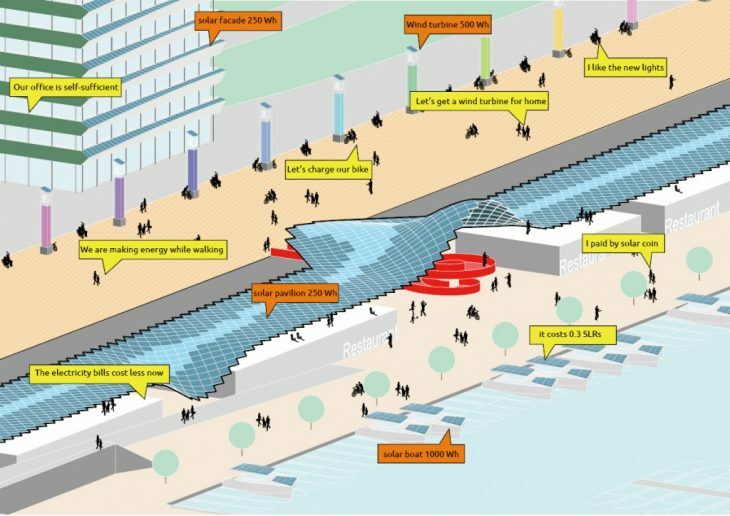 This project focuses on re-imagining Port Olimpic in Barcelona as a self-sufficient area. Barcelona is the first city with the Biosphere accreditation for sustainable tourism. As the city is committed to the Sustainable Development Goals, developing a self-sufficient Port Olimpic enhances the its ability to reach its vision. 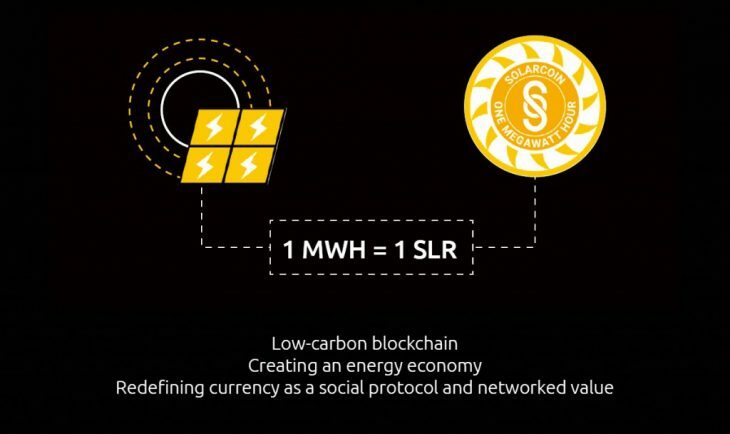 The project’s specific vision is to first to be aware of energy consumption. 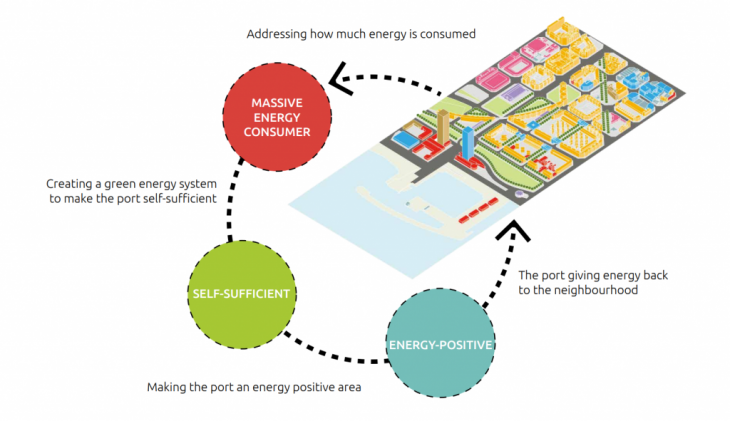 Then, develop a green energy system to make Port Olimpic self-sufficient. And finally, be a positive energy area that gives energy back to the neighbourhood. The yachts are big energy consumers in the port. However, with yachts installing solar panels on them, and the new designs with solar panels embedded in them, the port can be re-imagined as a solar farm and a temporary battery storage for the neighbourhood. 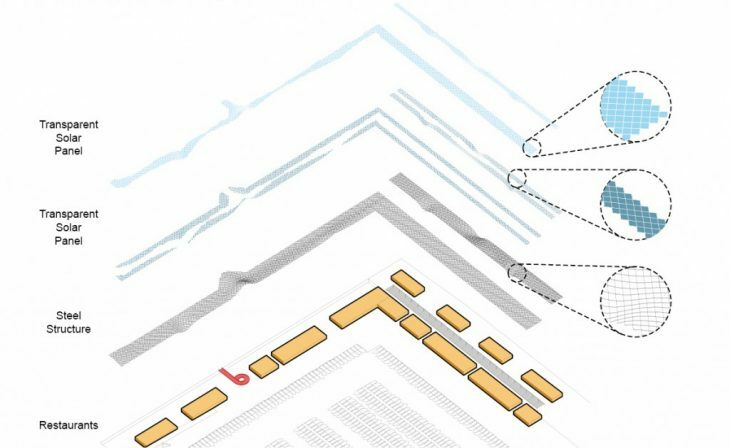 The system shows how the designed elements come together, and what other supporting layers are needed for a self-sufficient neighbourhood to work. 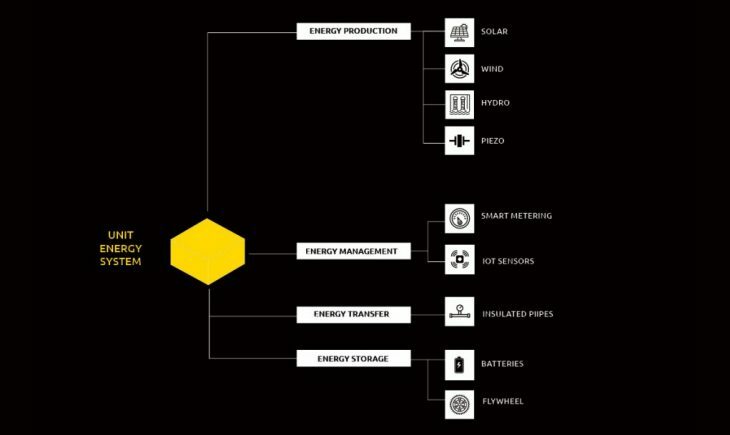 Each design unit consists of energy production, management of the production, transfer, and storage for that unit. 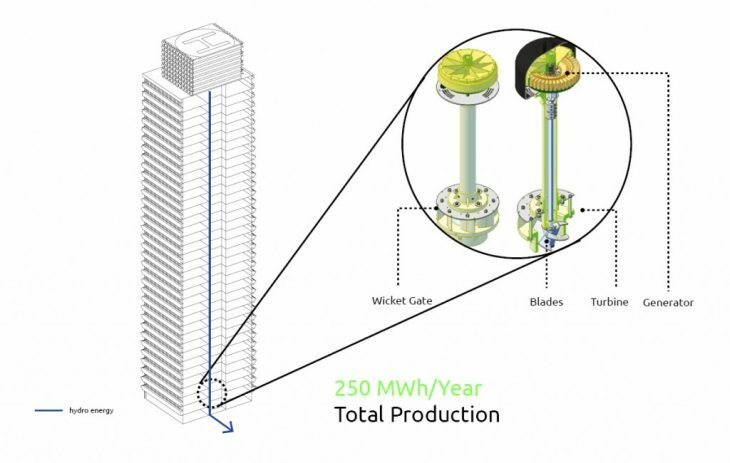 The storage technologies that are common for a neighbourhood scale are batteries and flywheels. 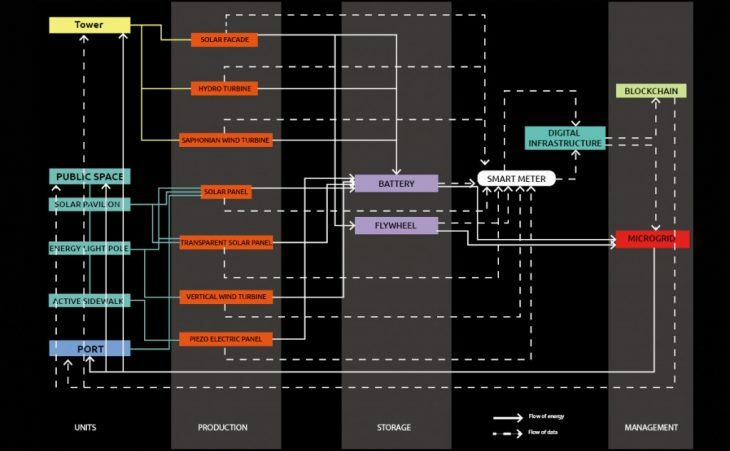 The traditional energy supply is a one way flow from the utility to the consumers. 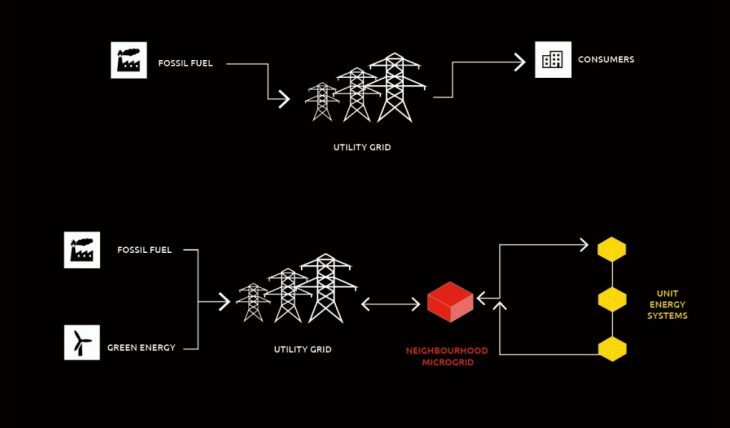 In the new Energy supply model, the grid becomes green by the renewable technologies, and microgrids enable the distribution of energy between local energy producers, transforming the role of citizens from consumers to “prosumers” ( consumer and producer). 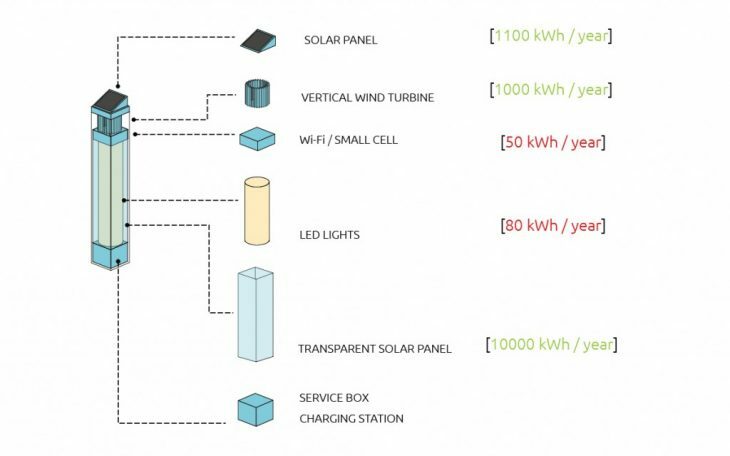 By implementing a microgrid, connecting the unit energy systems becomes possible while creating a sharing economy for energy in neighbourhood scale. The energy consumption and production in the neighbourhood is monitored by the IoT sensors in the unit energy system. 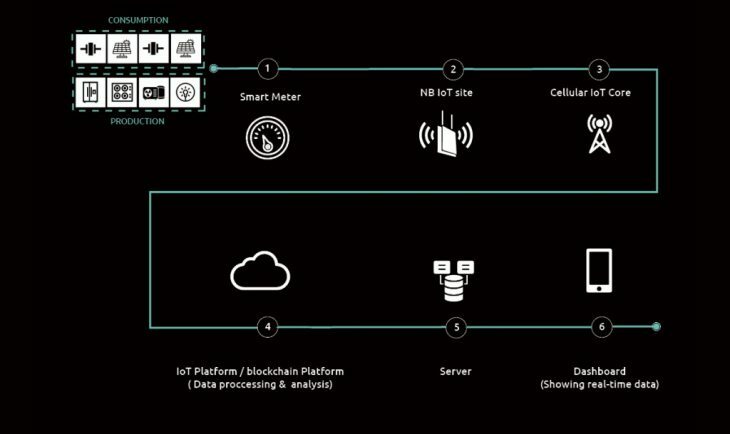 Measurement data and analysis of it happens in the digital layer of the neighbourhood energy system, in which the new technologies for connectivity (NB-IoT) is embedded. The flow of data in the digital infrastructure is shown in the diagram.